Scouts BSA Kickoff Flyer - Download Here! One of the characteristics of Scouting—for over a hundred years—is that no matter when you join, however long you stay, or the rank you attain, the Scouting experience prepares you for life. And for some, the pinnacle of their Scouting experience is achieving the highest rank of Eagle Scout. It is in the interests of the entire BSA, and in fact our nation, that all girls who join the BSA in 2019 should have an opportunity to earn their Eagle Scout rank should they diligently and promptly complete all requirements. Accordingly, after carefully considering recommendations from stakeholders, including feedback from volunteers and professionals at the 2018 Top Hands Meeting, the National Executive Committee of the Boy Scouts of America has approved temporary transition rules regarding extensions for youth over 16 but not yet 18 years of age on February 1, 2019 to complete the requirements for the Eagle Scout award. To preserve the integrity of the Eagle Scout Award, no exceptions to or waivers of any of the requirements for the Eagle Scout Award are permitted under this limited exception, and all requirements must be completed while the individual is a registered member of Scouts BSA, or after achieving the First-Class Rank in Scouts BSA (as specified in the BSA Guide to Advancement). Check out the Scouts BSA Launch Plan [PPT]. Access all of the Scouts BSA recruiting assets, including photos and social media images, in the BSA Brand Center. Direct youth and adults who are interested in learning more to scouting.org/scoutsbsa. Work with your council registrar using the instructions for displaying for Scouts BSA “coming soon” unit pins [PDF] on BeAScout.org. 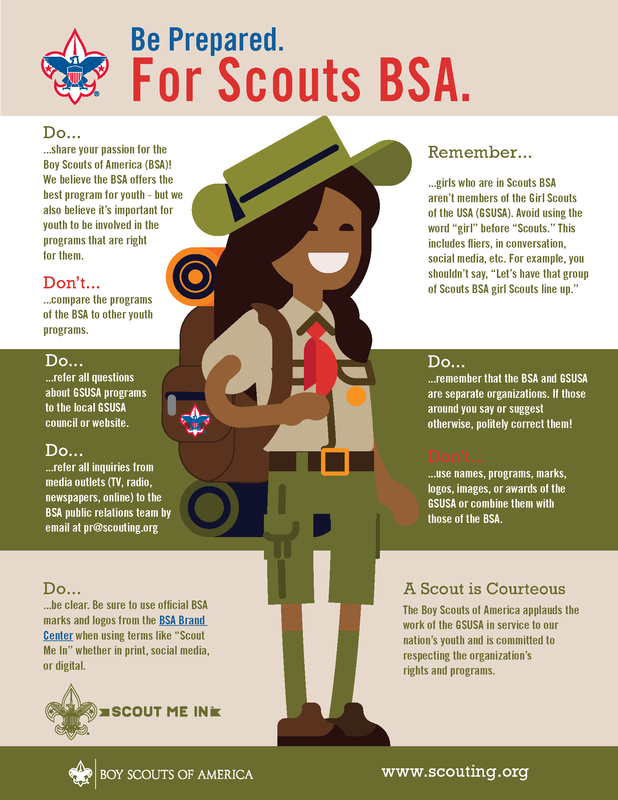 Download the Scouts BSA Brand Training Presentation! So, Charter paperwork is all filled out, recruitment of Leaders is already in place...What's next? REGISTER FOR THE NEW LEADER SKILLS TRAINING HERE ON JANUARY 19!